Looks like I've been neglecting the website a little bit, so stay tuned while I clear out the old listings and be on the lookout for new ones! We are going to try and showcase some of the more interesting and expensive items we have in stock on here. Most of the items we have for sale are listed on our Gunbroker.com listings. We are no longer listing new items on GunAuction, however please feel free to look at the over 9,500 positive feedbacks we have received on that site during the past 17 years as we transition over to GunBroker. The links can be found on the left side of the page. Please feel free to email us with any questions. We also have a Facebook page which can be found at www.facebook.com/obiantiquefirearms where some items from my personal collection will be featured from time to time. Thank you! 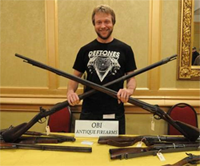 Antique and historical firearms dealer and collector George E. Ruben of OBI Antique Firearms in Oyster Bay, NY shows off a 1768 Charleville musket converted by the Confederate army during the Civil War, left, and a 1st Model 1762 Grice Brown Bess Unit Marked musket at The East Coast Fine Arms Show Saturday, January 5, 2013 at the Stamford Plaza Conference Center in Stamford, Conn. The gun show was hosted by the Westchester Collectors of Connecticut. Photo by Peter Hvizdak / New Haven Register.